You’ve done the base work, honed your technical skills, and you’ve built your aerobic base—together these three things will define your IRONMAN potential. 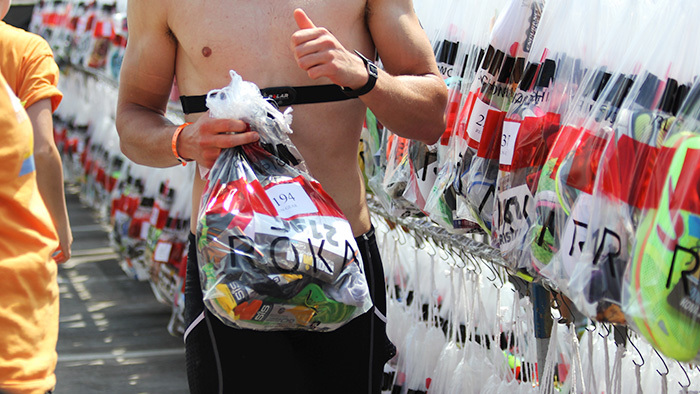 Adding specificity in the later stages of your training through IRONMAN simulation workouts will better prepare your mind for the specific environmental challenges and logistics of race day. Without specificity in training, you leave yourself open to unknown and preventable risks that, once trained, could turn into an advantage for you out on the course. In IRONMAN training we often string together multiple days of increasing stress through periodization, while the race is a single day of significant stress. We need to ensure we are mentally prepared for the higher race-day demands this will bring to our mental and physical endurance. To prepare well, we need to spend the time assessing our race day environment and make sure our training and preparation allows it to align with our skills, capabilities. In order to do this, we must form a strategy to execute by focusing on areas where there may be gaps between our skill set and the course. This approach is even more important where the race environment is unfamiliar or especially challenging. Racing in the IRONMAN World Championship, for example, has some specific challenges that do need intensive focus: heat, winds open water swim that is not wetsuit legal—, you do not want to be surprised about any elements like that on race day! Understand the race day environment. Be detailed in this analysis as familiarity will help you prepare well. Study the course map, talk to people who have done the race, and pay attention to the race’s local weather, both historically and in the weeks prior to your event. Consider heat training or preparing for inclement weather, especially if you live in a climate that is much different than that of your race. Isolate areas of the race that will have not been covered in your training so far and form a strategy to address these, either logistically, physically or mentally. Implement and practice the strategy throughout your build and peak phases. Be creative, it is about being mentally prepared as well as physically. Test, assess and adjust. Work with your coach, social networks, and experienced peers to validate the demands and where you are at in your fitness and experience level. Be self aware. Being prepared and understanding your strengths and weaknesses may mean you’ll avoid that meltdown in the later stages of race day. Location-hype level. Don’t change anything based on race expo sales and marketing. There are noo silver bullets, no new kits, no change to nutrition, no change to race plan that can possibly do you any good this late in the game. Registration and bike-racking logistics. Be on time, but don’t get flustered if things don’t run completely smoothly. Will you be swimming into the sun? Distance from T1 – how long is the run? Will you need flip-flops or shoes? Elevation profile, where are the hills? Do you need a power/heart rate cap strategy? What should be your gearing choice? Are headwinds and crosswinds expected (for example, those on the IRONMAN Hawaii course) which may lead to a different wheel choice? What is the road surface and condition, including the chance or rain? Will this alter your tire choice and inflation pressure? What is your expected aero time? Are you trained for this? Is there a potential for groups forming? Do you need an anti-drafting strategy? What is the expected race time temperature and humidity? Do you need to decouple hydration from nutrition? What may you require at special needs? Aid station stock. Do they have what you need? Have they run out in the past? Elevation profile, where are the hills? Do you need a heart rate cap strategy? What are the renowned “tough areas” of the course? What is the expected race time temperature and humidity. Do you need to decouple hydration from nutrition? What may you require at special needs for nutrition and clothing? Ticking off this checklist we can quickly identify race specifics that require some attention. These may be logistical, mental or require adaptation through training. Depending on where you live you may need to think outside the square in terms of simulating the environment. A good idea is to simulate the ride and run in and indoor area using heaters or air conditioning to simulate the climate. Another great example is to use BestBikeSplit to generate the course for your weight, Functional Threshold Power (FTP) and bike profile. This can be used on a ergotrainer indoors with a simulated climate using planned race day nutrition. I set this for athletes as a two ride day, riding the first four hours of the course in the morning and the remaining a few hours later. The IRONMAN run is about running on fatigued legs—it is what we do! Double run days or broken IRONMAN weekends ensure you are conditioned for this. A solid weekend is to do the BestBikeSplit course on a Saturday and two runs on the Sunday totaling the full course length (26.2 miles). The second run is on a indoor treadmill simulating conditions. A tough day to be followed by a couple of active recovery days—but you will know where you are at! Specificity is about being prepared. It ensures we leverage our strengths and are prepared for the specific demands of the day. It also ensures we have a plan for possible, uncontrollable scenarios. It is always easier to execute a planned response to an exceptional scenario that make up a plan on the fly than to come upon it unexpectedly and respond reactively. Train smart, do the work that counts, but most importantly—enjoy the journey. Paul Skelton is an Primal Health certified health coach, Triathlon Australia certified coach and TrainingPeaks Level 2 coach. He has been involved in endurance sport his entire life and a veteran multiple IRONMAN finisher. Currently the Director of coaching and Head Swim Coach for Redcliffe Triathlon Club, one of the largest tri clubs in Queensland Australia. Paul has a keen focus on fat adaption and carbohydrate periodisation as a foundation for endurance training. Paul also runs FitSets.com, providing online endurance and health coaching.